Show off a piece of Montana with this Montana Agate Pendant. This Montana Agate pendant is created in sterling silver. Perfect gift for yourself or someone special! Comes with a standard 18'' sterling silver chain. Made in Philipsburg, Montana. Every piece of Montana Agate is unique. 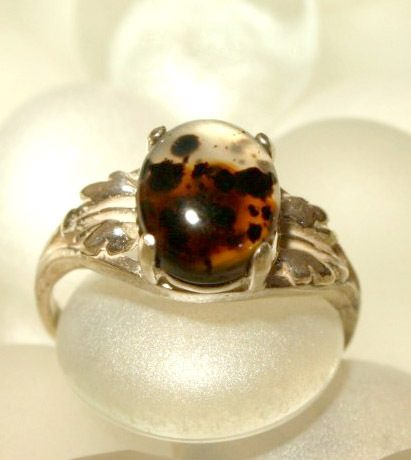 Show off a piece of Montana with this natural agate ring! The beautiful stone is set in sterling silver. Perfect gift for yourself or someone special! Made in Philipsburg, Montana. Show off a piece of Montana with these natural dangle agate earrings. These beautiful stones are set in sterling silver dangle earrings. Perfect gift for yourself or someone special! Made in Philipsburg, Montana. Every piece of Montana Agate is unique. Show off a piece of Montana with this Montana Agate Pendant. This Montana Agate pendant is created in sterling silver and is bezel set. Perfect gift for yourself or someone special! Made in Philipsburg, Montana. Every piece of Montana Agate is unique.